This recipe is also in the Essential New York Times cookbook. First & still favorite farro recipe for me. 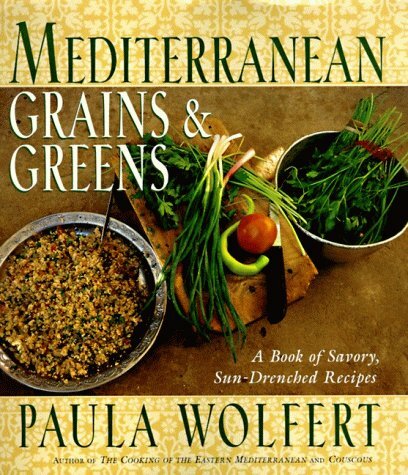 Online at Wolfert's site here: http://www.paula-wolfert.com/recipes/farro.html. Subtle so flavors of grains & legumes shine. Make mine vegetarian with some garlic. Small pot of soup so I always double it. Delicately flavored soup. I added some harissa to please other family members. Will make this again, and increase the recipe by 1/3 to 1/2. Like most Wolfert recipes, this one is some trouble, but worth it, and worth having more. I also use a pinch of ground coriander. This is the perfect summer recipe, no cooking, no hot stove, delicious and satisfying. A well-constructed and easy to follow recipe which was delicious to eat, particularly as I was able to use freshly picked Swiss chard as the leafy greens. The ingredients are for two servings and there wasn't really enough of it to make a full main course, it would be better as a lunch or part of a tapas meal. Next time I make it I will use more potatoes and eggs. Needed more broth than recipe called for - about another 1.5 cups. Otherwise this was good. According to my notes, I haven't made this since 2006 -- why not?, I wonder. Perhaps because I don't know how to spot an excellent winter squash. Sheerly by good luck I got a first-rate kabocha and have been munching off it for several days. This is a wonderful recipe. I add preserved lemon. Divine. I'm so happy to be able to use swordfish again, and the texture is perfect as an accent in this dish. Charmoula ... well, you could put charmoula on old socks and it would make them taste delicious. I'll undoubtedly make this again and again. Slices of turnips were too large. Could probably get same effect with chopped 1/2" turnips. The flavor medley was lovely. Make double the yogurt sauce. Award-winner Paula Wolfert presents dazzling variety in 200+ sun-drenched recipes that are high in fiber, rich in antioxidants and nutritional value and tantalizingly tasty from every region.